It’s that time of year again when thousands of students will walk the stage and graduate from culinary school. This, of course, is an exciting time for them, a time when they view the world as their oyster with limitless opportunities. This may be true, but with the caveat that requires the student, now graduate, to approach a career in food with the right attitude, willingness to learn, and eyes wide open. To those who find themselves in this position I am sorry to break the news to you, but there may be things that were left off the table, not emphasized enough, or simply ignored by you and your peers. As you transition very quickly from formal student to employee I believe that it is prudent to let you know that your education doesn’t end with the diploma – it only begins. Forgive me if you know, or think that you know the following, but regardless it is worth repeating. Let this sink in, take it to heart, work with it, and use this information to help plot your career path. I AM A CULINARY GRADUATE – NOW WHAT? True, there was a tremendous amount of information thrown your way during the 2-4 years of college. Some of it stuck and more than you can imagine simply bounced off your shoulders and landed elsewhere. Trust me when I say that there is much more to come. Only experience will allow the important things to stick, sink in, and allow you to grow into the chef that you want to become. No, you are not the best thing that ever happened to the kitchen that hired you. You might become that person, but right now please accept your role as a humble cook and student of the trade. Keep an open mind and realize that the person next to you is probably far more seasoned than you. You are not the chef – you are a cook. Start with the intent of being the very best cook that you can be. Take on this attitude with every position that is offered to you during those early years: prep cook, garde manger, banquet cook, the omelet station on a Sunday brunch, line cook, roundsman, etc. Being exceptional at each of these positions will be your real resume leading to the position of chef. Don’t leave things to chance – have a plan. Where do you want to be in five or ten years? If you don’t know, stop and figure it out today! What kind of restaurant or company, what position, what geographic location, what salary range, etc. Have a plan and write your road map to get there. Once you have built that strategy then try to stick with it. You can certainly adjust along the way, but make sure that you are always working from a plan. Your job, at least initially, is to make the chef look good. Learn to take directives, follow the methods that he or she has spent a career developing, accept and learn from critique, and learn when and how to offer your opinions and observations in a respectful manner. Your instructors taught you the “right way” to work, to prepare certain dishes, to hold a knife, to apply the foundational cooking methods, to set-up a station. This was important, but guess what – the chef who just hired you may want things done a different way. Your way is not better – it is just different. There may be a time and a place to offer your way as an alternative, but keep an open mind in the meantime. A sure way to limit your success is to try and become a square peg in a round hole. Fitting in doesn’t mean that you should accept bad habits or become part of a group of antagonistic employees, it simply means that before you can help an organization improve, you must win the trust and confidence of those around you. Once this becomes your persona, then you can gradually influence positive change. This will serve you well even as a chef. Yes, there are things that you have gained in culinary school that others in the restaurant may not be aware of. When the time is right, be willing to share this knowledge with others without appearing to be better than them. At the same time, realize that experience has made other employees very good at their craft – you can learn a great deal from them – keep an open mind. I know you invested a boatload of money in that education. I understand that you will be paying back your student loans for the next decade or so. Certainly your diploma means something and should be recognized, but you are not a chef yet. It will take time; you will need to pay your dues and work many positions that might even seem like a step back. All of this “real life” training will prepare you to be a chef – it is the experience of working that makes the title of chef attainable. Be patient, if you work your strategy, the position will be realized in the future. Take the leap – work in restaurants or food operations that challenge you. Seek out those opportunities that make you uncomfortable with your current skills. Always take on the positions that make you look in a mirror and tremble a bit with doubt. Ask for opportunities that are beyond you in an effort to learn through “trial by fire”. It is this battle experience that will make you exceptional at your job. Be an ambassador for the operation where you work. Show your pride and seek out any possible way that you can help the operation be successful. Become an advocate for cost control, work to make each task you are given – the most important task in your mind. Accomplish each job with passion and dedication to excellence. Become extremely valuable to the restaurant where you work. Aside from your need to “fit in” make sure that you hold true to your principles. If others in the kitchen are less concerned with how they present themselves in terms of grooming or uniform care- be the exception and present yourself as a professional. If others spend too much time putting down others and finding their cup half empty – be the one that always sees your cup as half full. At the same time, when the operation does have standards that are core to their brand, do not ignore them or fight to push them aside. Becoming the exception to well-established rules is a surefire way to relinquish your ability to “fit in” and make a difference. I do not propose that you attempt to show everyone else up, but rather to be that person that everyone admires for your work ethic. It doesn’t get easier as you move up the career ladder. The Executive Chef should also be the person who works harder than everyone else. This is how he or she got to that position. At the same time, make sure that you work smart. Working harder doesn’t always mean that you need to work more hours than everyone else. Be the one, from the first day on the job that others look to as the standard bearer of excellence. 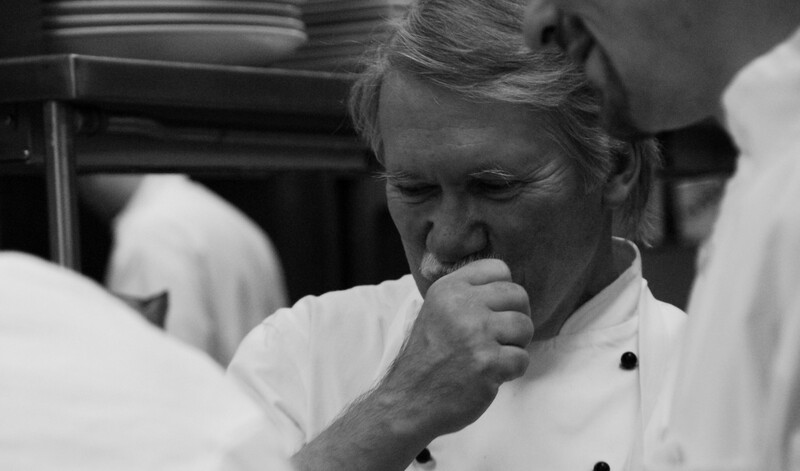 Apply this to everything – how you set your station, your commitment to sanitation, the way you treat others, your respect for ingredients, your understanding of cost control, your dedication to proper cooking technique, and your desire to always improve should become your signature. No cook is an island. You will learn this on your way to becoming a chef – you must depend on others if you and the restaurant are to succeed. The first step is to always commit to helping others in the same fashion. There are loads of temptations that cook’s face. The intense hard work and non-traditional hours will often lead to after work indulgence. Keep moderation as a rule of thumb and do your best to avoid the temptations that you know will lead down a rocky road. Connect with others in your field that share this same approach rather than those who seem to always live on the edge. This should be a great sign to print and hang over your apartment door. This is a simple reminder to work your strategy. Straying too far from the plan will only delay your objectives. It seems contradictory to point to a life of balance after reading the previous 19 points, but it is possible. Always find time to live a healthy life. Eat well, see a doctor routinely, exercise, and find some time to relax on your own and with friends. Build this into your schedule as tasks that are just as important as preparing your mise en place for tonight’s service. Remember when that chef or chef instructor told you that you would work very, very hard? Remember when he or she told you that you would need to give up a lot if you truly want to be successful? Remember when others stated that the work is physically, mentally, and emotionally exhausting? Well, they were right and you stuck with it anyway. Guess what – almost any career will carry much of the same baggage if you have a vision of making that career an important part of your life. Make sure that with this understanding you learn to be in control of your career and not the opposite. During my externship and after culinary school I was extremely dismayed to find that I would never get a chance to try all of the common sense suggestions above to try and fit into the kitchen as there seemed to be a form of “reverse discrimination” in the kitchen I was working in. After only just setting a foot in the door I was labeled as the one that went to school. I was even asked outright if I thought going to school would make me a better cook than…….. Now, please understand that at the point I entered this kitchen I was still just a frightened, excited culinary student and so, had no bad attitude, was immaculate in appearance and listened to everyone to try to gain as much knowledge as possible. I really wasn’t given a chance. I understand that this is prevalent thinking and has been expressed in media also but people like Anthony Bourdain. On national tv he as much as stated that unless you started as the dishwasher and worked your way up, he didn’t consider you a real cook and that he certainly thought culinary school was a waste of money. I just need to know, on what planet is it ok to think that people who try to get an education before beginning a career should be penalized for having been so foolish as to go to school. And yes, I realize nothing replaces good, old fashioned experience and hands on hard work in an actual kitchen.